We love leaving our customers satisfied. That's why we always make sure to give every service call 110% of our effort. Here are some of the latest projects we completed. 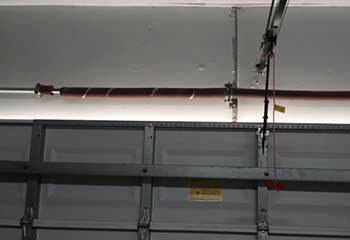 Customer Issue: The garage door torsion spring broke and he needed to get his car out very soon. Our Solution: The first thing we did was to hoist the door up and set it on ladders to allow the customer to get their car out of the garage. 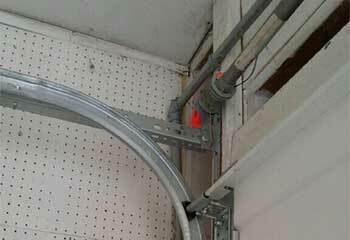 Then, we removed the broken spring and installed a new one. We then lubricated the new torsion spring, adjusted its tension to suit the door's weight and made sure the entire mechanism was working smoothly again. Customer Issue: Door makes a lot of noise while moving. Our Solution: We first eliminated some of the usual suspects by checking and lubricating the torsion springs, the hinges and other moving metal parts. After noticing some of the rollers were still making a lot of noise, we replaced them with new units, which we then lubricated too. This made the door much quieter and made it move more smoothly as well. Customer Issue: Needed replacement of a frayed cable. Our Solution: Our team removed the damaged cable and replaced it with a new one that met the manufacturer's specifications. 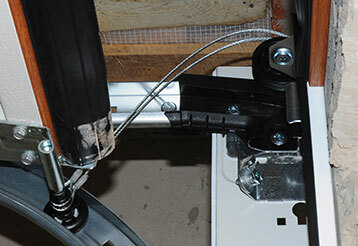 We aligned and lubricated all door parts and made sure the door's entire mechanism was operating properly. Customer Issue: Needed a new section of track. 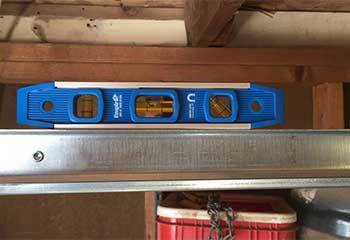 Our Solution: Our team replaced the track on the customer's door and made sure it was properly aligned. We also tightened all the bolts and lubricated all of the parts to make sure the door was working properly. Customer Issue: Needed replacement opener with Wi-Fi. Our Solution: The owner selected the opener he wanted and we replaced his defective unit with the new one. 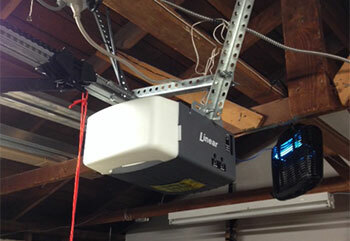 After checking the alignment, we tested the unit and made some slight adjustments so that it operated perfectly.